One of the biggest mistakes beginners make when playing Hold'em poker is that they stay in the game for too long even with hands that are worthless. This happens especially when they place blind bets - they desperately want to get their money's worth, even if their hand clearly shows there is no chance in Hell they will recover their bets. One of the golden rules of Hold'em is that once you place a blind bet you have to consider it already lost - there is no use in trying to win it back, as such attempts usually lead to even more losses. This being said, let's see which are the hands that if you get dealt you should instantly fold. 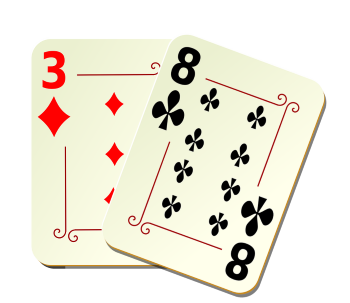 Whenever you are dealt the five worst possible hands - off-suite combinations of 2 and 6, 7, 8 and 9, as well as an off-suite combination of 3 and 8 - which give you very little chance to a valuable hand with a slight chance to win. Of course, there is a chance to win even with such a horrible hand, but only as much as winning the jackpot at any online casino. Fold the instant you see them. 10 time World Series of Poker bracelet winner Doyle Brunson once won a bracelet with a starting hand of 10-2 - this is why the hand was names in his honor. He is a great poker pro, with five decades of experience behind him, so for him it was not such a big problem. For you, though, it might - you need to be very lucky as well as a very experienced player to be able to win a hand with such a pocket. If you are a beginner, fold as soon as you lay eyes on the Doyle Brunson (the hand), especially if you play against Doyle Brunson (the pro). Whenever you are dealt a face card and an unsuited low card, you'd better fold. For example, J-2, K-2, K-3 and so on. Of course, such a hand is not a certain loser - sometimes it might win a pot or two - but only rarely, so it isn't worth the risk. As I said, none of the above hands are without a chance of winning, but these chances are slim enough not to be worth taking the risk. It's better to fold while you still can and sit out a round than to almost certainly lose.